The Dreyfus affair shook France, and Europe, greatly affected French politics and jeopardized France’s future. The significance of the affair on French politics from 1894-1906 was to be colossal. The affair triggered many movements that were dormant and waiting for such commotion to appear. With hindsight we can deduce that the Dreyfus affair was not the start of a political battle but an event that precipitated the final battle where the fate of the French republic would be decided. During this investigation we will be analyzing the various affects the Dreyfus Affair had upon politics in France, from the years 1894 to 1906. To present an elaborate and in-depth analysis of the question posed, primary and secondary sources will be used, including French and English sources. I have chosen to investigate the Dreyfus Affair as I have noticed that its importance is beginning to fall into oblivion. The French population has now almost forgotten how different their lives would be if the Dreyfus Affair had taken a different turn. Reducing the importance of the affair has gradually occurred due to authors that have only briefly overlooked it in French history schoolbooks.1 Thus, in total defiance to these inaccurate and neglectful historians, I have set out to prove that this affair was not minor, not insignificant and that it was a colossal event that shaped French politics of the 20th century. Even today, it is possible to perceive how the Dreyfus Affair acted upon politics in the later parts of the 20th century. We can see how the French collaboration with Nazi Germany during Vichy France was directly related to the Dreyfus Affair. This collaboration was the revenge of the nationalist right-wing elements that had failed to overthrow the government. 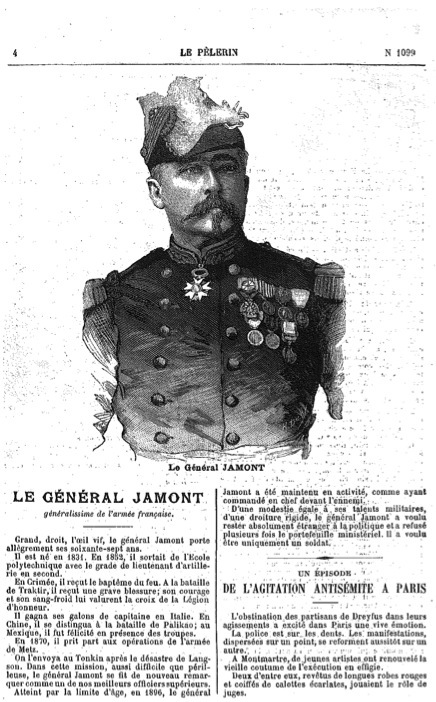 An even more pertinent example of the continuing repercussions of Dreyfus Affair was the dishonourable discharge of Colonel Paul Gaujeac (head of French military archives) in February 1994 after submitting a dubious report stating, “Dreyfus’s innocence is the general thesis claimed by historians.” These examples show that even today, the subject of the Dreyfus Affair is still relevant. One can compare the Dreyfus affair to the assassination of Archduke Franz Ferdinand in 1914; both of these events triggered enormous repercussions but were not directly related to their affects. The affair widely revolutionized the thoughts of French politics, and made way to something that could have never been imagined before, the credibility of the government. In its early stages, the affair utterly jeopardized the political scene by rekindling a latent anti-Semitism that had never been seen in France. This latent anti-Semitism that the French population had been amassing finally burst out on every scale of society. 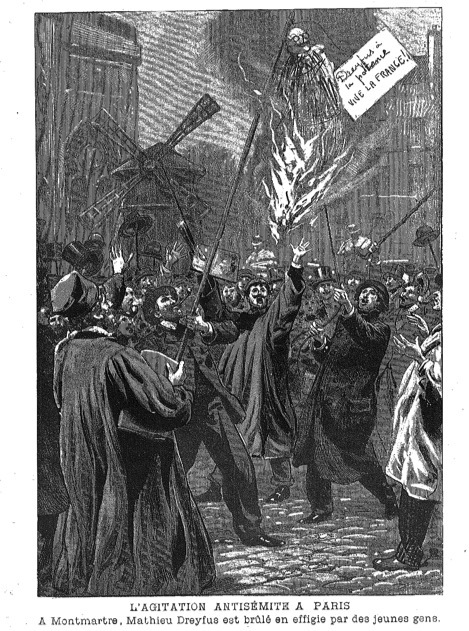 This outburst was due to discontent triggered by various social and economical changes decreed by the government in the final quarter of the 19th century. In the space of a few weeks after the first trial of Dreyfus, France was divided in two. Both sides were passionate about this affair and on every social class of society started a brutal political battle, where powerful men chose their sides and the media became a lethal arm, France was utterly mobilized. During its later stages, the affair worsened the political situation and created two distinct sides, two Frances. These two opposing sides both used the media to turn public opinion to their favour, and in the space of weeks the press had become the predominant arm used. This affair was not a banal one, it had taken a massive importance and its outcome would decide which political road France was to take, a democratic one, or an authoritarian one. But before entering the analysis of the impact of the Dreyfus affair on French politics, we must understand the sequence of events of the affair. On the morning of Monday the 15th of October 1894, Captain Alfred Dreyfus was summoned to present himself at the French Ministry of War. The Commander Paty de Clam, alongside three other inspectors, welcomed Dreyfus and proceeded in asking him to write a peculiar letter, dictated by Paty de Clam. This letter contained sentences from the infamous “bordereaux” which was a letter written by a French spy, found in the dustbin of the German military attaché in Paris. The French Ministry of War was searching for the spy and were testing various officers that could be suspected of treason. As Dreyfus wrote the letter he shivered and the three men scrutinizing his every move, noticed his trembling, thus deeming it as a sign of culpability. “He is cold, he shivers, an incontestable sign of his culpability”2 Dreyfus was immediately arrested for high treason and deported to the prison of Cherche-Midi. On December 19th, he was court marshalled in front of a set of anti-Semitic juries who judged him guilty and sentenced him to a degradation and life sentence on the Devil’s Isle (French Guiana). In January 1898, Commander Esterhazy was trialled following the discovery of various pieces of evidence gathered by Dreyfusards that raised suspicions on whether he was a spy. Esterhazy was acquitted, and the Dreyfusards ridiculed for their persistence in trying to incriminate an innocent man (Appendix 1). 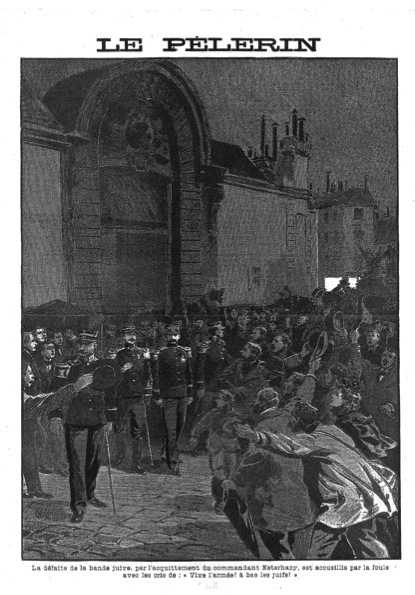 In 1899, five years after Dreyfus’s incarceration, the trial was re-opened thanks to the numerous politicians, military figures and intellectuals that had accumulated evidence of Dreyfus’s false accusation. But to the Dreyfusards surprise, instead of releasing Dreyfus, the court found him guilt once more and sentenced him to ten years of prison after having withdrawn his life sentence. It was not until the French President granted amnesty to Dreyfus that the tables turned for the Dreyfusards. In 1903 after his rehabilitation, Dreyfus sent a letter to the “Garde des Sceaux” demanding a revision of his trial. Finally in 1906, the court recognized Dreyfus’s innocence and the false accusation that had been made against him. It was recognized that Esterhazy was culpable, but he was not put on trial, and neither were the ones who participated in the conspiracy. Now, with this background information we can analyse the various affects the affair had upon French politics, but first we must trace back to the causes of the affair, anti-Semitism in France, post 1894. Besides the fallacious article written by Edouard Drumont where he claimed that France was suffering from a Jewish colonisation of 500,000 Jews, (“According to a governmental demographic study made in 1890, 67,780 Jews are counted throughout France”)7 there were no significant surges of anti-Semitism in the press or the public. Undeniably there had always been clerical factions that withheld anti-Semite views but these were only minor. The Dreyfus affair was set at a very unfortunate moment in time; the affair took place at the very heart of the 1890s right after the rapid rise of anti-Semitism had attained its peak. In the years where the anti-Semitic press searched for examples of the wrongdoings of the Jews, Dreyfus became an easy target. Anti-Semitism only seriously escalated in the last quarter of the 19th century by reason of the harsh new economic and social reforms the government was carrying out. This new restructuring imposed many changes in the life of common citizens, and subsequently triggered widespread anxiety, fear and anger. These feelings incited the citizens in searching for a reason their lives had suddenly become so difficult, they felt that someone or a group of people were behind their misery. But what most did not understand was that the government caused their despair. It had prioritized technological and industrial progress over more favourable conditions of life, and had allowed the exploitation of workers in the name of industrial progress. This created a significant influx in people that adhered to anti-republican parties of the right and worker parties of the left. It was during this period that the political landscape was shaping itself for a struggle and waiting for an occasion to reshape politics. Throughout the last 15 years of the 19th century, discontent was felt on every scale of society, “ the development of capitalism imposed difficulties upon entrepreneurs and traders […] the harsh law of banks where people were pushed to financial ruin disgusted everyone […] on a governmental scale, people disliked the new democracy, the hypocrite principles of equality, the parliamentary system, the rejections of Christianity by the state.”8All of these resentments against this restructuration made by the government accumulated the fear and anger felt against the new democratic government of France. But most citizens could not understand how so suddenly their lives had taken a turn for the worst. As they searched blindly for a reason that their lives had turned for the worst, the ancient anti-Semite sentiment resurfaced. Amidst this pandemonium of hatred, the Dreyfus affair emerged, at a moment where anti-Semitism was gradually on the rise again. It was only after the Dreyfus affair had come to light that a latent anti-Semitism became widespread in France, thus greatly affecting the orientation of political movements and the outcome they would have. This new anti-Semitism, shouldered by the press became the main weapon for the right-winged nationalist parties; it played a major role in the division of French politics and was a major reason why the Dreyfus Affair politically divided France in such drastic way. Throughout the affair, the media was used and exploited by various groups that attempted to turn public opinion to their favour. The Dreyfus affair was the predominant factor that changed French politics, but the press was the trigger that incited change. While the anti-Dreyfusard and anti-Semitic newspapers (who represented the majority of the press, such as La Libre Parole, L’anti Sémite, La Croix, Le Pèlerin, L’antijuif, Le Petit Journal) continuously incriminated Dreyfus, fewer Dreyfusard newspapers (such as L’Aurore, Le Siècle) frantically defend “the martyr of the century.”9 The press was used as a weapon by both sides, the right used it to fanaticize the anti-Semitic masses, while the left cunningly manoeuvred its articles to denounce the conspiracy the army was carrying out. The day after the government had mentioned that a Jewish officer was suspected of treason, outbursts of anti-Semitism eventuated. Anti-Semitic newspapers display Dreyfus as a traitor, while others decided to wait for the verdict before publishing their opinions. On the night of the 22nd of December 1884, the juries voted upon Dreyfus’s guilt unanimously and the verdict was pronounced. The next morning the news erupted on every newspaper, a Jewish officer was found guilty of treason. At that point, all newspapers believed in Dreyfus’s guilt “from right to left, there is not one newspaper that defends Dreyfus.”10 Ironically the German chancellery promptly published a communiqué (24th December 1894) stating that “the German Embassy never had any connection whatsoever with Captain Dreyfus”11 with hindsight, at that point, we can start to distinguish the power of manipulation withheld by the anti-Dreyfusard press. Subsequent to the German communiqué, the anti-Dreyfusard press immediately published articles, denouncing that the statement issued by the German Chancellery was a futile cover-up. “Every time the Germans affirmed not knowing Dreyfus, the anti-Dreyfusard press would deem their declaration as an attempt to protect their spy”12 Scarcely one week after the affair had come to light, the media was already becoming a valuable weapon in order to keep Dreyfus guilty in the eyes of the masses. On it’s own, the Dreyfus affair was already immensely significant to French politics, it’s outcome would decide what political path the country would follow, but as the press entangled itself, it amplified the affair and as a result, turned it into an outright struggle. At the start of the affair, the anti-Dreyfusard press greatly outnumbered the Dreyfusard press, there was virtually no newspaper that did not chose a side in the affair.13 There were only two Dreyfusard newspapers counting 200,000 readers against six anti-Dreyfusard newspapers uniting 2,170,000 readers. This staggering disproportion in numbers represented a flagrant weakness towards the Dreyfusard press to which the battle seemed to be a futile struggle. But although the anti-Dreyfusard press represented the majority it did not cease to publish articles where falsifications and lies were elaborated upon. These newspapers stated the most extravagant facts and constantly falsified the truth in order to convince public opinion. Little did these newspapers know that this steady forging of the truth would bring them to their defeat as they built their statements upon dubious pieces of evidence, and anyone who made an in-depth investigation would discover that their thesis was a fraud. With hindsight we can deduce that the press played a crucial role throughout the affair. It amplified the significance the affair had upon politics; an insignificant treason was turned into a political battle by the press. Its significance on politics was massive as it brought the struggle one step further, France was truly divided in two mainly because of the struggle the media was also fighting. Due to the press, an affair that could have stayed governmental became political; heated debates in the parliament moved towards the media. “The press became the power of opinion, it amplified the political movements without creating them. For the first time the press disposed of a powerful influence on French politics; dramatising, supporting, or denouncing the authorities.”14 Throughout the Dreyfus affair the press was the utensil political movements used to promote their ideas, these political movements divided France in two and waged a violent struggle that would decide the fate of France. Prior to the Franco-Prussian war of 1870, France was politically divided in two; on a simplistic scale there was one faction in favour of the republic and another against it. Within the anti-republic faction, various political movements were present; although they believed in the same main idea, these movements disliked each other, competed against each other and were not united. Contrary to the anti-republican faction, the pro-republican movements were more united, although an inconsequential rivalry was felt, they shared many of the same political beliefs alongside their appreciation of democracy and the republic. It was only during the affair that the movements opposing the republic united and formed the anti-Dreyfusard faction. It is here that we can now understand the chain of events that the Dreyfus Affair created upon politics and what impact it sparked. The movements supporting the republic equally united themselves to defend Dreyfus (called the “Dreyfusards”) and rival with the rising tide of numerous anti-Semitic and anti-republic movements. “The threat from the Right […] had reactivated the old slogan ‘No enemies on the Left.”15 However, due to their youth and inexperience (the republic was only 13 years of age), these socialist, democratic, anti-clerical and pacifist movements did not dispose of as many followers as the opposition. As both sides united amongst themselves, it can be perceived that the Dreyfus affair was starting to create a serious impact on politics; the division between the two sides preceding the affair had been amplified and the significance of the affair would have different impacts for each movement. Outnumbered and criticized, the Dreyfusard movement had all odds against it, but nonetheless it firmly believed in the principles of truth and justice, thus it’s press refused to publish false statements like the anti-Dreyfusard press. Instead, realizing that the democracy was in danger and that the evidence held against Dreyfus was based upon falsified documents, numerous of the key figures of the movement spent years investigating and scrutinizing the proof of Dreyfus’s culpability. They did so in the only intent, to use the same pieces of evidence (such as the infamous bordereau) that had been exploited to put Dreyfus in prison, to once again use them to set him free. While the Dreyfusard movement searched for the evidence of Dreyfus’s innocence, their press riposted against the wave of false statements and attacks published by the opposition. Zola’s published letter to the president (J’accuse, 13 January 1898) in the newspaper: l’Aurore, was one of the strongest counteract aimed at denouncing the conspiracy against Dreyfus. Although this publication reinstated hope for the Dreyfusard movement, it subsequently created an immense uproar of anti-Semitism in France and her colonies; this letter triggered the culminating point. Deemed as “the longest day of the affair”18, the publication of this letter brought about the destructive political impacts the affair had upon the masses. This letter hit the anti-Dreyfusard movement so hard that it triggered anti-Semitic riots all over the French Empire. “Riots regroup 4000 people in Marseille and Bordeaux, 3000 in Nantes. […] But it is in Algeria that take place the largest hysterical anti-Semitic riots, […] there is not one day in 1898 that an anti Jewish riot is not seen.”19 In Paris, “rioters burn Dreyfus’s mannequin, the police is outnumbered. Riots, which are dispersed in one area, resurface at another”20 unable to counter such an eloquent letter, the anti-Dreyfusard movement were constrained to resort to violence. As the affair progressed, “the time came slowly when the Dreyfus affair turned into the affair (without Dreyfus).”21 Amidst this raging political battle, Dreyfus himself truly held little importance; instead, both movements attributed a considerable amount of significance to his trial because it reflected the fate of the republic. If Dreyfus was acquitted, it would demonstrate the truth of the Dreyfusard (and pro-republican) movement, while the definite conviction of Dreyfus would give justice to the anti-Dreyfusard movement. This would have been a massive victory for the anti-republic movement, as it would have falsely showed the public that they had been struggling for the righteous cause. Subsequently, it would have proved that the pro-republic movement was corrupt since it defended a criminal, and thus made them lose many supporters. Ensuing such a victory, with a larger amount of supporters the anti-republican movement could have then demanded a referendum asking for the abolition of the republic. This scenario would have put the republic in peril, and could have engendered the arrival of a totalitarian or militaristic government, jeopardizing the future of France. Thankfully the anti-Dreyfusard movement failed, it lost the second trial and the intellectuals of the Dreyfusard movements were able to prove that all evidence held against Dreyfus was falsified. As a result of losing the trial, the militarist anti-republican movement was disarmed, it was seen as an obscure political force that prioritized it’s own corrupt justice and disregarded truth. Consequently they had no reason to demand a referendum as they had been on the corrupt side of the affair; the pro-republic movement had won through righteous means and struggled for the protection of truth. Following the affair, the pro-republican movement gained a considerable amount of support from the masses and the republic itself was saved. As a result of the affair, “the republic achieved maturity […] and was evidently accepted by the vast majority of the electorate as the only regime possible for France.”22 Alongside that, it assured its dominance over the army and destroyed all hopes for the monarchists and militarists who longed for the restoration of the monarchy. The affair modified politics on the whole, it reinforced the democratic parliament and put forth the values of democracy, but predominantly it announced the defeat of the reactionary forces, and the victory of the republic over the army and clerical movements (the two main anti-Dreyfusard motors). The victory of the republic was sealed in 1905 by the separation of the church and state, from that point, religion lost its place in the realm of politics. The impacts of the Dreyfus affair upon French politics during the years 1884-1906 were numerous. At first it further widened the gap between the anti-republic movement and the pro-republic movement, then it united the rightwing parties together in a common objective, to topple the republic. The affair affected right-wing politics by uniting parties with totally different ideologies and by restoring hope of disintegrating the republic by changing public opinion and demanding a plebiscite in order to change the constitution and instate a more authoritarian government. It then subsequently affected the left-wing parties as they had to defend the attacks made on the republic by the right-wing media. The left-wing movements were affected in the sense that they needed to prove, against all odds, that Dreyfus was innocent and that it was the army that was corrupt. Since the debuts of 19th century politics and multiple-party states, the media has always been present as a means of communication and persuasion. During the affair it was important to emphasize its importance as it amplified the political battle that took place between the left and the right. Overall the Dreyfus affair helped the republic reassert her power over the army and parties who wanted to topple the democracy. Reverberations of the affair can be seen with the implications of Vichy France in collaborations with Nazi Germany; the Vichy government became the revenge of the nationalists and right-wing elements that had failed to topple the republic during the affair. Birnbaum, Pierre. L’Affaire Dreyfus La République en Péril. 4th ed. Paris, France: Gallimard, 1994. Print. Bredin, Jean-Denis. L’Affaire. Paris, France: Julliard, 1983. Print. Emile, Zola. Lettre à la France [Brochure]. Paris, France: E. Fasquelle, 1898. Print. Kayser, Jacques. L’Affaire Dreyfus. Paris, France: Gallimard, 1946. Print. Lee, Stephen. Aspects of European History 1789-1980. London, Britain: Routledge, 1982. Print. Marrus, Michael. Les Juifs de France à l’Epoque de l’Affaire Dreyfus. Bruxelles, Belgium: Editions Complexes, 1985. Print. Miquel, Pierre. L’Affaire Dreyfus. Paris, France: Presse Universitaire de France, 1959. Print. BBC Radio 4. The Dreyfus Affair. In Our Time: London, Radio. Web. 08 Oct 2009 <http://www.bbc.co.uk/radio4/history/inourtime/inourtime_20091008.shtml>. Fitch, Nancy. Mass Culture, Mass Parliamentary Politics, and Modern Anti-Semitism: The Dreyfus Affair in Rural France. American Historical Review Feb. 1992: 55-65. Web. 1 Oct 2009. <http://www.jstor.org/stable/2164539>. Jacobs, Joseph. Dreyfus Case. Jewish Encyclopedia. 2002. JewishEncyclopedia.com, Web. 21 Aug 2009. <http://www.jewishencyclopedia.com/view.jsp?artid=482&letter=D&search=Dreyfus%20Affair>. Sinclair, Michael. Alfred Dreyfus and “The Affair”. Jewish Virtual Library. 2009. The American-Israeli Cooperative Enterprise, Web. 28 Oct 2009. <http://www.jewishvirtuallibrary.org/jsource/anti-semitism/Dreyfus.html>. Winock, Michel. Les Affaires Dreyfus. Vingtième Siècle. Revue d’histoire, Sciences Po University Press Mar. 1985: 19-37. Web. 23 Sep 2009. <http://www.jstor.org/stable/3769302>. 1 Jacqueline, De Bourgoing, & Martine, Gardini (1996). Mega France. Paris, Fr: Editions Nathan. A drawing of Esterhazy’s acquitting with an anti-Semitic caption stating: “The defeat of the Jewish horde as Commander Esterhazy is acquitted, welcomed by the crowds who shout: Long live the army, down with the Jews.” Source: Le Pelerin. Un épisode de l'agitation antisémite a Paris. Promenade a Travers le Monde des Nouvelles, (Ep. 1099), 4-6. January 23, 1898. Source: Bredin, Jean-Denis. L’Affaire. 1st ed. Paris, France: Julliard, 1983. Print. Source: Emile, Zola. Lettre à la France [Brochure]. Paris, France: E. Fasquelle, 1898. Print. Translation of marked document on page 17: “An episode of anti-Semitic agitation in Paris. The Dreyfusards obstinacy has created in Paris a vivid anti-Semitic response. The police is powerless, riots that are dispersed, resurface in other areas. At Montmartre, young artists have revived the old tradition of executing an effigy of Dreyfus” These extracts are important in understanding the media’s implication in the affair, and in the diffusion of anti-Semitic ideas through the masses. Source: Le Pelerin. Un épisode de l'agitation antisémite a Paris. Promenade a Travers le Monde des Nouvelles, (Ep. 1099), 4-6. January 23, 1898.